Use HubSpot's social tool to create and publish social posts to promote your blog content or landing page offers on social media, increase traffic to your website, and reap the SEO benefits of being active on social media. Learn how to craft perfect social media posts on the HubSpot Marketing Blog. The social publishing dashboard displays all social posts that have been published from your HubSpot account. In the upper right, click Create social post. In the right panel, select the first social network to publish your social post to. You can publish social posts to Facebook, Instagram, Twitter, or LinkedIn. If you haven't connected your social accounts to HubSpot, set them up first before continuing. Only users with the Facebook page roles Admin or Editor can publish to Facebook pages. With effect from August 1, 2018, Facebook no longer supports third-party applications posting to personal Facebook accounts. 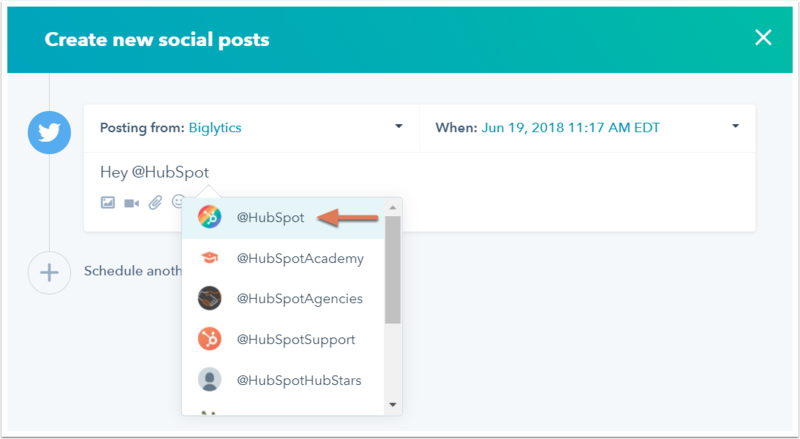 As a result, HubSpot no longer allows posts to be published or scheduled to personal Facebook accounts, and they will not show up in the social composer. In the text box, enter the content for your social post. 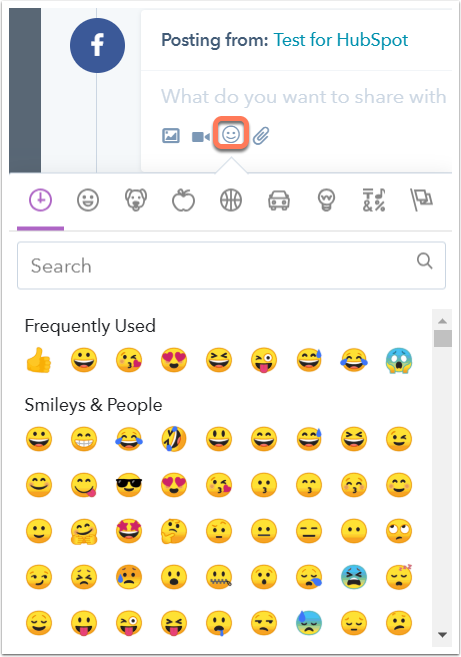 To add emojis to your post, click the emoji icon emojic. If you're creating a Facebook, Instagram, LinkedIn, or Twitter post, you can use the @ symbol to mention or tag other accounts. Instagram mentions will not be auto-completed, but Instagram will acknowledge the mention when the post is live. After you've drafted your post content, choose the content you're going to promote. To attach a HubSpot-hosted blog post or landing page to your post, click the attach icon attach and select the blog post or landing page, then click OK. This will insert the title and link of your content directly into your social post. If you want to share content that isn't hosted on HubSpot, enter the content link directly into the text box. Once you've added the content link, a post preview will be generated from the content metadata. This will include a picture (if available), title, meta description (if available), and link. Instagram does not support links in posts. By default, the HubSpot social tool will shorten links in your social post to a hubs.ly link. If you own a branded short domain on Bitly, you can connect your Bitly account to HubSpot to use your branded short domain for links in social posts. You cannot use custom tracking URLs in social posts published through HubSpot. 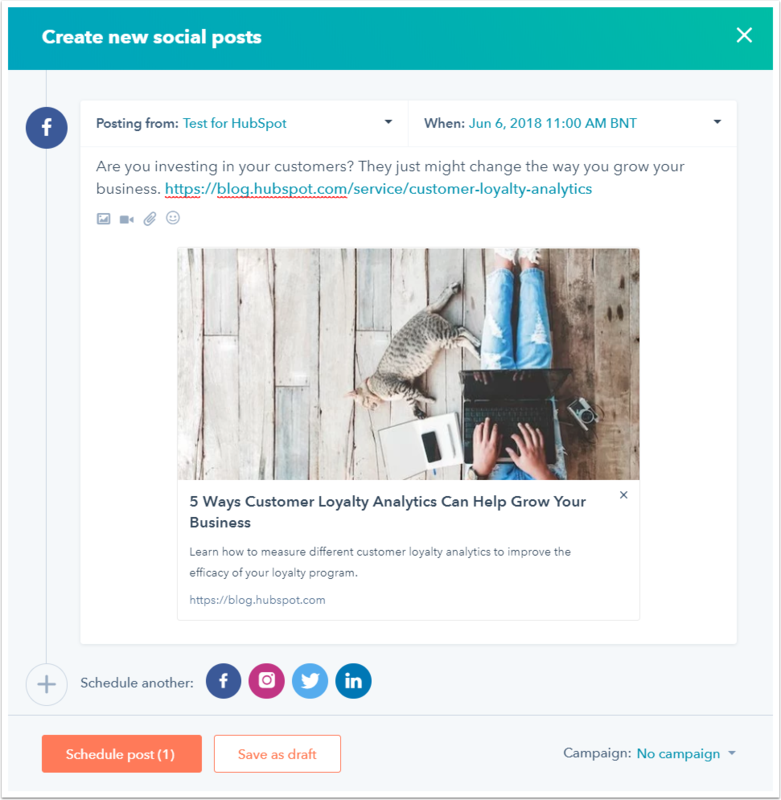 HubSpot automatically adds tracking parameters to posts published through the social tool to track traffic back to the original post. To insert an image, click the image icon insertImage. You can select an existing image in your file manager, or click Add image to upload a new image from your device or a URL. If you're posting to Facebook or Twitter, you can post up to four images in one social post. Click the image icon insertImage again to insert another image. If you're posting to Facebook, Twitter, or a LinkedIn Company Page (Instagram’s API currently does not allow third-party video posting), you can insert a video by clicking the video icon insertVideo. You can select an existing video in your file manager, or click Upload videos to upload a new video from your device. Images or videos must be posted with accompanying text in the social post. 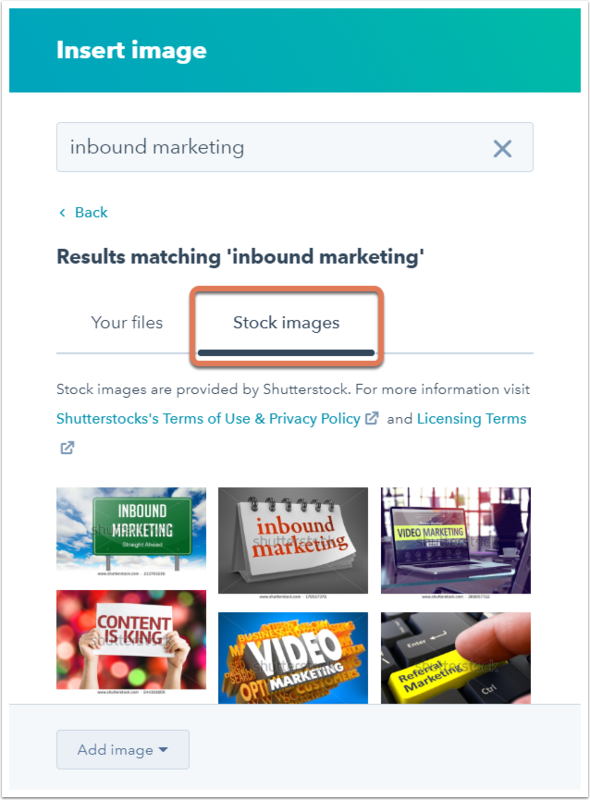 If you have a content link in your social post, any images or videos inserted into the post will replace the image generated in the post preview. Images and videos must be uploaded in one of the following formats: png, jpg, jpeg, gif, mp4, avi, mov, mpeg4, mp4, or m4v. Animated GIFs will play on Twitter, and will not play on Facebook, Instagram, and LinkedIn. Video uploads cannot exceed 20 minutes in length. The composer will automatically select a publish date based on your social publishing schedule, but you can change the date by clicking the When dropdown menu. You can select a specific date and time, or click Publish now to publish the social post immediately. Lastly, select a HubSpot campaign to associate the social post with. In the bottom right, click the Campaign dropdown menu and select a campaign or click Create a new campaign. Once you've finished setting up your social post, you can choose to publish another post or publish to another social account by clicking the corresponding social icon next to Schedule another. This will automatically duplicate your existing post content into the new post. In the bottom left, click Schedule post or Publish post now to schedule it for publishing or publish it immediately, depending on the publish date and time you selected.